The Watershed of Scotland is a line that separates East from West and divides those river basin areas which drain towards the North Sea on the one hand, and those which flow west into the Atlantic Ocean on the other. It meanders from Peel Fell on the English border all the way to the top at Duncansby Head: over 754 miles (1,200km) through almost every kind of terrain. The Watershed follows the high ground, and offers wide vistas down almost every major river valley, towards towns and communities, into the heartlands of Scotland. 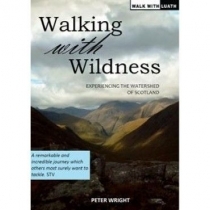 Walking with Wildness leads the reader through breathtaking, hitherto mostly unknown landscapes, providing valuable advice for walkers on the way.